Our society is increasingly in the grip of technology. How far does the control of high tech networks about our society? Far,as shows HACKING HABITAT . High-tech systems and institutes take charge. Smartphones have become spyphones with data combinations that establish your identity more exactly than a fingerprint. Surveillance camera’s are hidden in thermostats and everyday packaging material in supermarkets function as hightech listening devices. Facebook directs our social life and Google sends you without hesitation to the next purchase. Algorithms control not only financial transactions but also decide about our digital citizenship. 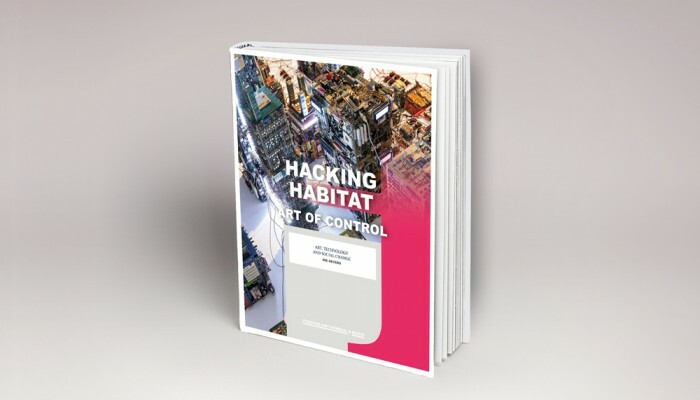 High time to claim back our environment – to hack our habitat. HACKING HABITAT provides a sense of ‘a-whereness’with three perspectives: Data & Surveillance, Finance & its Logics and Destructive Forces. Counterstrikesis the fourth and meanders through all spaces: artists, ethical hackers and groups of concern make the remote control tangible and know show to use the technology to our advantage. You can order the publication in our webshop.